The Wildlands Project is a far-reaching effort by scientists and activists to develop better ways of protecting nature, wilderness, and biodiversity. Its ultimate goal is to establish an effective network of nature reserves throughout North America -- core conservation areas linked by corridors, and buffered, where appropriate, by lands that may also serve economic objectives. Continental Conservation represents the work of thirty leading experts-including Michael Soulé, John Terborgh, Reed Noss, Paul Paquet, Dan Simberloff, Rodolfo Dirzo, J. Michael Scott, Andrew Dobson, and others -- brought together by The Wildlands Project to examine the science underlying the design and management of these regional-scale networks. It provides conservationists and biologists with the latest scientific principles for protecting living nature at spatial scales that encompass entire regions and continents. The book ends by challenging the reader, whether scientist or advocate, to commit more time to the effort of saving nature. The authors argue that the very survival of nature is at stake, and scientists can no longer afford to stand behind a wall of austere objectivity. Continental Conservation is an important guidebook that can serve a vital role in helping fashion a radically honest, scientifically rigorous land-use agenda. 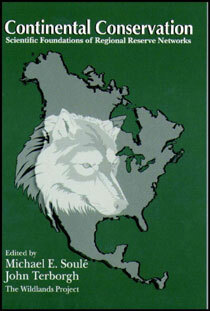 It will be required reading for scientists and professionals at all levels involved with ecosystem and land management.